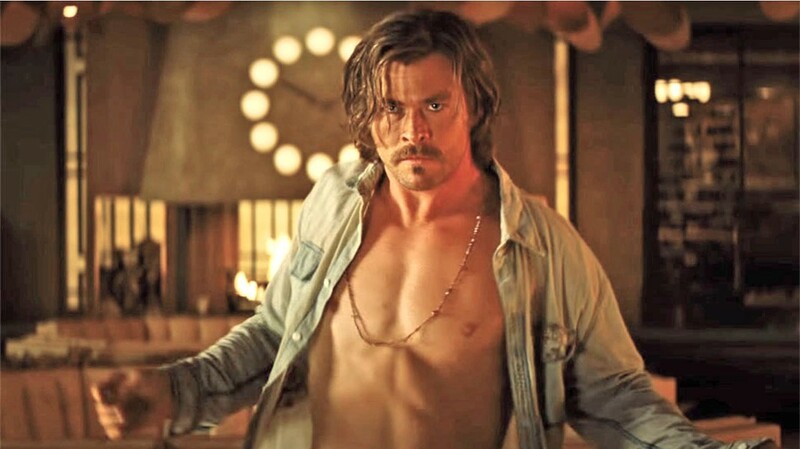 DARK CHARISMA Chris Hemsworth stars as Charles Manson-like cult leader Billy Lee, who rains down holy hell on the El Royale hotel. Glen This is one of those films I was glad not to know too much about. It's better to let its surprises unfold around you, and man was I surprised. The whole "seven strangers in a hotel" setup sounded like an Agatha Christie bit, but this film goes wildly and surprisingly off the rails. If you need some touchstones, think the Coen brothers (Blood Simple, Barton Fink), Joe Carnahan (Smokin' Aces), and Quentin Tarantino (The Hateful Eight). The hero of the story is Darlene Sweet, a living-paycheck-to-paycheck lounge singer, who we learn almost made it big. Of all the characters, she's the most sympathetic, though Father Flynn is a close second. He's losing his memory, and Bridges delivers a very effective performance. Erivo as Sweet gets to show off her amazing voice, and the film's soundtrack is filled with great Motown sounds. It's a stylish, clever thriller with a wallop of an ending. Aside from Sweet, no one seems to be who they say they are. Hamm is great as the supposed vacuum cleaner salesman. He's too slick to be a lowly traveling salesman. Johnson's Emily Summerspring looks like a hippy, but it's not peace and love she's selling, and who's the tied-up girl (Cailee Spaeny) in her room? As good as all the performances are, the standout for me is Miles Miller (Lewis Pullman), who plays the front desk man. Even he's harboring some dark secrets, and now that I think of it, he's pretty sympathetic too. One reason the film worked was it was about bad people, but not irredeemable people—well, except for Billy Lee, the cult leader, who Hemsworth plays with a menacing, Charles Manson-like charisma. When I first came out of the film, I wasn't sure how much I liked it, but I have to say it grew on me over the course of a day or so. Some viewers might think it was overdone. I think that was director Goddard's whole point. Anna I'd heard this film in promotional spots at the top of a few true crime podcasts I frequent, so the theme of "not everyone is who they say they are" was well drilled into my head going into it. But the film managed to surprise me nonetheless. It didn't turn out to be as much of a twist-turned adventure as The Hateful Eight or Murder on the Orient Express for me, but like you said, this one grew on me as the dust settled in the days after viewing. Bridges is a personal favorite, and while friends found it quite amusing that it was him I was there to watch and not the almost always open-shirted Hemsworth, he didn't disappoint as the flawed but sympathetic Father Flynn. The character of Miles was also a standout for me and one with more secrets than anyone can guess. Erivo's voice is powerful, soulful, and a wonderful backdrop that sets the mood for a dark and mysterious tale. Johnson and Spaeny held court as the brooding and beautiful mysterious pair, each with their own agenda. I wanted to punch Hemsworth's Billy Lee right in the face, which means he did a great job creating a smarmy, too powerful trickster with an eye for young girls. This is exactly the type of movie that you don't want too much given away beforehand, so without revealing more, I will say that it will keep you guessing at what this ill-fated group in a creepily remote hotel will encounter next. None of it is very pretty, but it sure is fun. Glen After the opening setup—a flashback 10 years prior—the film settles into a pretty slow beginning. It's all dialogue and set-to-simmer intrigue. Just when I thought to myself, "This film's dragging," the unexpected happens. That sets in motion a series of events, but before all that unfolds, we see—Rashomon-style—the same event from several characters' perspectives. That's some crafty filmmaking, and with that, the hook was set and the film reeled me in. Quick violence, on-a-dime plot twists, and the crazy over-the-top ending follows, with a fairly sweet denouement. This is definitely a film I'd watch again, and I won't soon forget Pullman's performance. He hasn't been in a lot of films, but he sure is good in this one. He plays Miles as a man on the verge of a nervous breakdown, and when his backstory hits, it all makes sense. Yes, the film's pacing is a bit uneven, its story is a bit too unbelievable, but this it pure entertainment. You just have to go with it. BAD TIMING Jeff Bridges stars as fake priest Daniel Flynn and Cynthia Erivo as nightclub singer Darlene Sweet, in Bad Times at the El Royale. The two cross paths as trouble bubbles up around them.